Tasked with the mandate of an upward review of salaries, the Nigerian Labour Congress has opened a can of worms, one that would now result into a slippery slope of all sorts. The crux of the matter is an increment of the minimum wage from a meagre N19,800 to a paltry N30,000. Even though N65,000 would have been a better upward review, the labour unions have chosen to settle for N30,000 which is agreeable for a start. Seeing the minimum wage as an avenue to reopen a closed case, the Nigerian Governors through their forum (NGF) have responded that the proposed minimum wage will be a huge cost to bear on their finances that is now rock bottom. In their defence, the Governors opted for an upward review of the revenue allocation formula, hinging the payment of the N30,000 minimum wage on increased allocation. Following the claims put forward by members of the Senate to the Revenue Mobilisation Allocation and Fiscal Commission (RMFAC), the current revenue formula is described as illegal. Adamu Aliero, APC-Kebbi, submitted that the current formula is “unconstitutional” as it has no law backing it and does not reflect the country’s present realities. Howbeit, the Revenue Mobilisation Allocation and Fiscal Commission (RMFAC) have fired back, saying the revenue sharing formula is backed by law as they chose to blame the Legislature for their failure to successively turn the tables around in former administrations. Ibrahim Mohammed, the RMFAC Commission Spokesperson, who reacted to this reminded the Senate that the first Revenue Allocation Formula was passed by the National Assembly in 1982, during the Second Republic of former President Shehu Shagari. Mohammed who reacted to this in a lengthy publication ‘Current Revenue Sharing Formula is Legal’ by The Eagle Online dated March 5th, 2018, argued that the RMFAC is in the right. 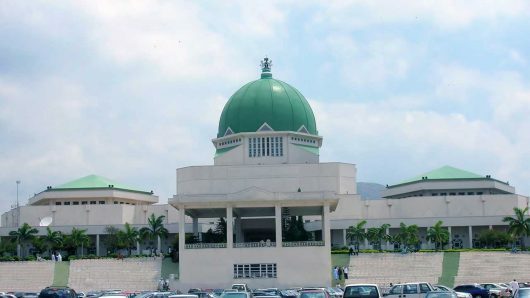 In fact, he blamed the National Assembly for their continued failure to conclude deliberations on the matter which kept on since 1982 till the current administration. The reality of the revenue formula currently is 52.68% for the Federal Government, 26.72% for states and 20.60% for the 774 local governments. Experts have frowned at this arrangement; reasons being that the Federal Government are identified to be the biggest beneficiaries of the revenue sharing formula with almost double the allocation 36 states are meant to be sharing. For a government practising fiscal federalism, 52.68% revenue allocation for the Federal amounts to wastage. While some experts believe at most, the Federal Government should collect no more than 35%, the means of allocating revenue to the states is a cause for concern. According to the allocation of revenue act, funds are meant to be shared as follows: 56% revenue to be owned by the Federal Government, 24% for the State Government and 20% for the Local Government. Out of the 56% of monies allocated to the Federal Government; 48.50% goes to the Federal Government, 2% goes to General Ecological problems fund; 1% goes to Federal Capital territories; while 3% is dedicated to Development of Natural Resources. The hues and cries for the review of the revenue allocation formula is characterised by the derivation principle used to allocate 26.72% to all 36 states where Nigeria as a country, has failed to move past its dependency on oil. This is because the derivation principle is a reward based system that directs a special 13% of the revenue back to the affected areas where it came from. In other words, all this drama is due to the methodology of sharing oil revenue. The struggle for the control of wealth has led to an unfortunate shift from revenue oriented principle to expenditure oriented principle. Beyond the special 13% reserved for oil producing areas, revenue allocation to most states is very hard to come by since it is based on the level of land mass; terrain (water sides, plains, highlands); amount of rainfall; education; health and access to water. In the lieu of this, a couple of states get favoured over the other because not all states possess the all-round gifts of land mass or terrain some areas undisputedly possess. But the states still don’t get to enjoy much revenue. In the end, 10% of their total revenue is finally remitted into the State Joint Local Government Account every quarter. Little wonder states have continued to owe workers long lists of unforgivable fringe benefits, assets, salaries and allowances. In a comment attributed to Minister of Labour, Senator Chris Ngige, he said payment of the proposed minimum wage increase is not borne out of the need to safeguard workers welfare. But the big question- if the states can actually afford the pay it. Nevertheless, both Federal Government and the states have refused to pay N30,000 all along. Until Tuesday last week where they chose to pay N27,000 and now N30,000, for the State Government and Federal Government respectively, should the labour unions agree. There is no better time for the minimum wage to be reviewed than now. Nigeria has been listed as one of the numerous African countries alongside Uganda, Morocco, Malawi, Namibia and Rwanda to have the lowest minimum wage of N19,800, which is at best 54 US dollars. If we are to juxtapose that figure against the poverty level of $1.90 per day, we would arrive at approximately N688.29. If we go further to multiply that amount – N688.29 x 30 days will equal N20,648.70. If we go further to minus this figure – N20,648.70 from N19,800, we will arrive at a N848.70 deficit. Little wonder, Nigeria is described as the poverty capital of the world. CEO of Global Analytics Consulting Limited, Tope Fasua, agrees to this claim. “Labour has a right to demand for higher wages at the time, given spiralling inflationary rate in the country, which has compounded since the last review in 2011,” Fasua says. Going further, Mr Fasua, who is also the Abundant Nigeria Renewal Party (ANRP) presidential candidate, said the value of N18,000 in 2011 has diminished to less than N8,000 today. To compute a minimum wage, consideration must be given to the prevailing cost of living index, inflationary trend and capacity of employers to pay a living wage. Living wage is based on the belief a worker should earn enough income from his or her work to afford the basic living costs of his or her family. According to wageindicator.org, living wage is an approximate income a worker needs to meet his or her family’s basic needs for food, housing, transport, health, education, tax deductions and other necessities. In other words, living wage should take care of the worker’s food costs, housing costs, transport costs, tax/contribution costs and other costs, including medical and children education. Therefore, in approving minimum wage, consideration must be given to all the essential needs of workers and their families. But, Mr Fasua said Nigerian government at all levels do not always bear in mind these factors when paying their workers. “Divide N18,000 by 30 days, that comes to N600 a day. What can anybody do with N600 per day?” Mr Teriba asked in an interview with Leadership newspaper. At N56,000 (the initial figure labour proposed), he said this would translate to a paltry N1,866, an amount he says is not even up to what some less endowed countries pay their citizens as unemployment allowance. This is according to an analysis by Bassey Udo, Premium Times Business and Economy Editor. Experts have continued to argue on the importance of increasing the minimum wage and what it will mean for the economy. The common scare the masses will entertain if the minimum wage is increased is inflation and the ripple effects on the economy because the moment the average rice seller, or okada rider hears salaries has increased, prices of things will naturally go up and inflation will abound. Many experts have disagreed against this, citing economic upheaval as a multiplier effect of the salary increase, not forgetting to emphasize that it will do good in lifting the worker out of the poverty level. The gross implications of a pay raise just like the Governors suggested to President Muhammadu Buhari, if forced to pay this increase is mass retrenchment of staff, a very pivotal thing that several experts have said would happen since monies used to increase turnover will now be directed into salaries and worker’s welfare; some people may have to be laid off. “Many critics think that raising the minimum wage will hurt precisely those workers that this policy is designed to help because firms will lay off workers to save on labour costs. Raising the minimum wage, critics argue, will create more unemployment and more reliance on public assistance. But there is no evidence to support this claim: states with a minimum wage higher than the Federal minimum have experienced faster rates of job growth than other states. How is this possible? Joseph Olaoluwa is a Public Affairs Analyst. But then there are other grim details to consider. Going by the 2017 Budget implementation report recently released by the federal ministry of budget & national planning, Nigeria is bankrupt and any urge to increase the minimum wage symbolises biting more than what they we can chew. The report shows the total revenue Nigeria realised from all sources, including tax and crude oil exports, was N2.657 trillion, while recurrent expenditure, consisting overheads, workers’ salaries, service wide votes, was N2.7 trillion. This dire implication means the country even borrowed about N100 billion to finance the recurrent budget, while the country paid N1.634 trillion as debt, meaning for every 100 kobo we (Nigeria) borrowed, 68 kobo was used to repay the debt, leaving 32 kobo. If we borrow to augment recurrent expenditure and service wide votes, it means the country is bankrupt,” Mr Onyekpere, Centre for Social Justice (CENSOJ) noted. Nigeria is a country whose daily oil production capacity has consistently dwindled below the 2.3 million barrels projection in successive federal budgets since 2016 with the country’s foreign reserves on a downward trend from about $45 billion at the end-July to $44 billion on September 20, while the Debt Management Office (DMO) reports a rising public debt profile currently at about N22.4trillion as at June 30, this pressure will drive us a longer way downwards.